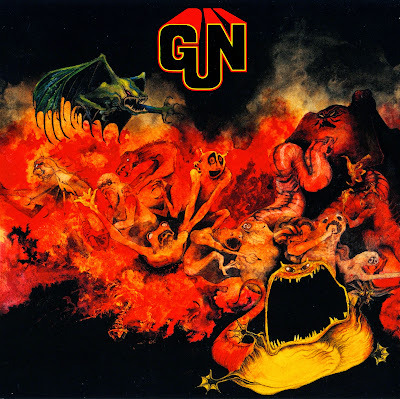 From Ilford in Essex, this heavy rock band's finest moment was undoubtedly the frenetic Race With The Devil, which was subsequently reissued in 1979 and 1982. It also achieved some Chart success. The follow-up, Drives You Mad, was similar in style. Their first album's front cover was the first designed by Roger Dean and musically, it was very much part of the first wave of British hard-rock. Both their albums were psychedelic/progressive crossover items and could potentially also appeal to fans of either of these genres. The Gurvitz brothers progressed to Three Man Army after Gun's demise. Later on, Adrian Gurvitz recorded solo albums. Farrell also played with The Bulldog Breed. Pete Dunton went on to T2 and also recorded a solo 45. Jon Anderson was their vocalist in a pre-recording line-up.